Soon, it will be Dussehra and the demon king, Ravana, will go up in flames as a symbol of evil vanquished by good. What does Ravana think of his dark side? A group of storytellers in Delhi is attempting to highlight a less-read narrative of the Ramayana from the perspective of Ravana. Titled Ravula, the performance will be held in the Capital this weekend. “Ravula is the name of Ravana in stories told among the lower-castes of Karnataka, for whom he is the fulcrum of the Ramayana,” says Yuveka Singh. 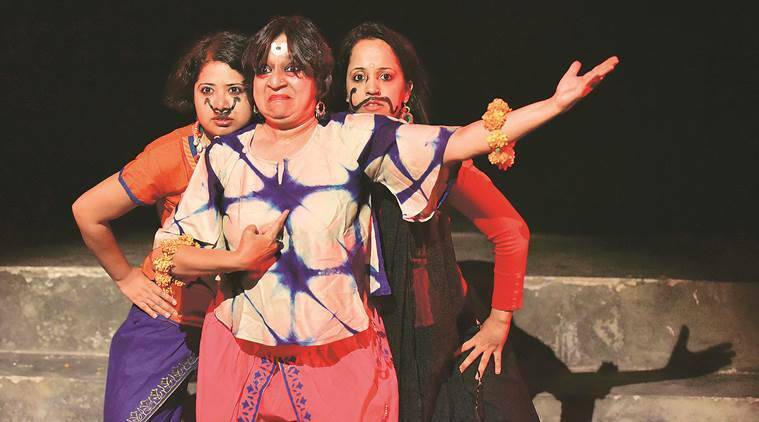 Singh and her co-directors and co-performers, Madhavi Menon and Nitika Arora, form the group Darwesh, which is better known for heritage walks in Delhi that include elements of theatre and performances. “It was on one of these walks, ‘Dasamukha in Delhi 6’, that we bumped into Rama in every lane of Old Delhi. Since our focus has been to tell stories of the other, we decided to look at Ravana closely,” she adds. Their performance begins at a swayamvara, when Ravana recognises that Sita is his daughter. “How could that be?” ask the performers before branching off into a Kannada story in which Ravana and his queen, Mandodari, are trying to have a child but with no success. A holy mendicant, who was none other than Shiva, gives Ravana a mango, whose flesh is meant for Mandodari but Ravana eats it instead. “Immediately, he becomes pregnant, with each day equaling one month, until he sneezes and Sita is born. Sita, in Kannada, translates into ‘he sneezed’ and, in Sanskrit, it becomes ‘the furrow’, where she is found,” says Singh. The three performers interchange roles and use dance, songs and storytelling on a minimal stage. Menon draws from her training in Kathakali, Seraikala Chhau and Hindustani classical music to break the verbose narration. She hums Raga Yaman Kalyan when Ravana’s mother ties a necklace with nine gems around his neck. “Each time she looks at her son, she sees the reflection of his many heads and names him Dashamukha. The raga connotes peace, joy and happiness,” says Menon. There is an auspicious song during the swayamvara and a shloka from the Mahabharata to show “Ravana as a man of strange imperfections who, deep down, is aware of his flaws”. One of the final scenes in the play is also its raison d’etre. “Brahma is talking to Ravana about anger, lust and other negative feelings. With every dark emotion he mentions, Brahma extinguishes a flame from a candle on stage. Ravula will be staged at Studio Safdar, Delhi, on September 10, from 6.30 pm to 8 pm. Entry: Rs 250.